The Mindtree L&T Takeover Saga Raises the Question – To whom does a Company belong? When a company goes public, the public investors have their rights. As much as the management which generally holds the largest chunk of shares post the public offer. In India right from the government, the management in control continues to believe that minority shareholders are more of a nuisance to be weathered then opted in as fellow promoters of the company. In 2017, LEEL sold its consumer business and Lloyds brand to Havells for Rs 1,600 crore. The promoters at that point of time held around 56% stake with the rest 44% distributed among public shareholders. Yet, the public shareholders did not see a single rupee come into their accounts even as much of the money generated were invested into other promoter held companies. Stock is now down 92% from its peak and while the promoters can atleast console themselves that they got 1600 crore, for the public shareholder it’s a near total write-off. This isn’t the first or the last time promoters are able to reap gains greater than what their shareholding allows them to thanks to inability of even large shareholders to hold the promoters to account when it comes to their duty towards the minority shareholders. Jeff Bezos started Amazon and is now the world’s richest man primarily due to his shareholding in Amazon. Yet, he holds just 16.3% of the total shareholding and even this is considered way bigger than what most company managements in US hold. In India, it’s the other way round with most managements holding directly or in-directly 51% or more of the companies they run. This allows them to ensure that there is no third party interference and be able to hold them accountable. 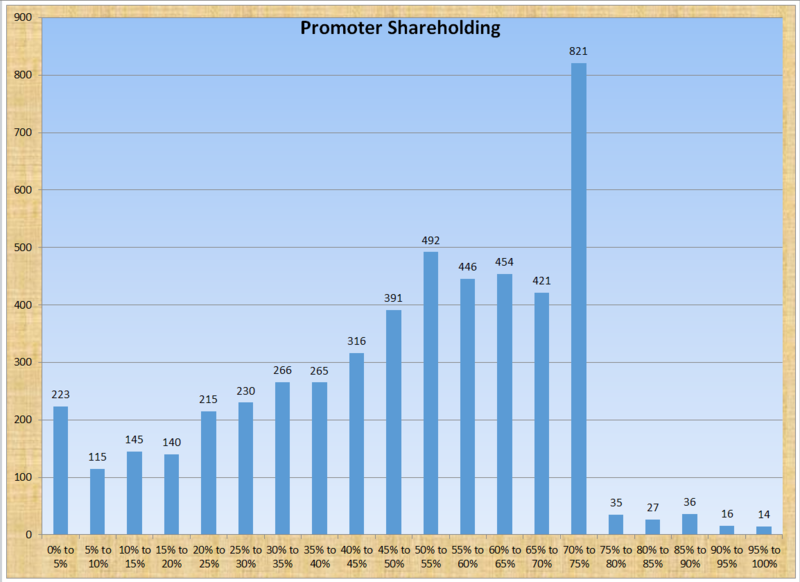 As the chart below showcases, almost 55% of all companies listed in India have promoters holding 50% or more directly. Many who fall in the bracket of 35 – 50% have shareholding with unknown body corporates (local and FII) holding substantial stake. Majority of companies where promoter hold less than 25% are those which are either on the death watch or even been delisted from the exchanges. The positive of such a high level of shareholding elsewhere is that the promoters are seen to be having substantial skin in the game and hence will do whatever best for the company. In India, as we have seen in episode after episode, most promoters treat the company as nothing more than their personal piggy bank which they can use without being bothered. From buying Aircraft to Expensive cars in the company name for personal usage, nothing is beyond the limit for many a promoter. What’s wrong then with too little management shareholding? Nothing except someone else can walk in and take over control and change management. A ‘takeover’ – even hostile, because if management doesn’t own much, they can’t do much to stop it. Very few good companies in India have promoters holding a miniscule percentage of the shareholding and these companies are always under threat of a large shareholding deciding to try and acquire the company. There are exceptions here – HDFC has no promoter, and neither does ICICI bank. But let’s see one such situation. Larsen and Tourbo, the company that now seems destined to go in for a hostile takeover battle with the promoters of Mindtree was itself subject to a take-over battle in the earlier two decades. First by Manu Chhabria which was thwarted when L&T brought in the Ambani’s as their White Knight. Later when Ambani’s themselves wanted to take over, and everyone including LIC and the government got involved in keeping them away. Eventually Ambani sold his stake to Birla’s at a huge profit – but couldn’t get into the manager’s seat. AM Naik – the chief of L&T – though got the better of both by allowing L&T to be managed professionally. Birla wanted the cement arm, so they demerged and sold the cement business as Ultratech to the Birla’s. The first major corporate raids in India took place in the 1980’s when Swaraj Paul sought to control the management of two Indian companies, Escorts Limited and DCM (Delhi Cloth Mills). Swaraj Paul bought up a substantial number of shares of Escorts but was stymied when the company refused to transfer the said shares. The battle and the events that followed is in itself is a great read. Some of this is covered in Pranab Mukherjee’s book, The Turbulent Years: 1980 – 1996. Corporate raids are tough in India. You can’t acquire more than 26% without an open offer to the rest of the shareholders. You can’t as a promoter acquire more than 5% a year through “creeping” buys. If an open offer fails or otherwise, you have rules like you can’t own more than 75% unless you try to delist the company. And so on. Mindtree was a venture backed by V. G. Siddhartha (of Coffee Day fame) by way of both contribution of capital as well as contribution in terms of time and effort. Ashok Soota prior to starting Mindtree was with Wipro where he oversaw the IT division grow from 6 crores in 1978 at the time of his joining to seeing revenues grow to nearly 2000 crores. Soota started Mindtree with nine other co-founders, many of whom he had working relationship during his years at Wipro. With their combined expertise and experience, the company has come a long way and today commands a market cap of 15 thousand crores. Yet, the ride hasn’t been smooth for internal differences in a way led to Ashok Soota quitting Mindtree to start another IT firm in 2011. At the time of the exit, Ashok Soota was the largest shareholder in the company and when he quit, he sold his stake to VG Siddhartha making VG Siddhartha the single largest shareholder in the company. But VG Siddhartha despite his large holding was always an outsider with no board representation. This in itself is generally not a normal behaviour since large investors would want board representation to ensure that they are onboard with regard to the on-going in the company. Keeping the distance from management though worked beneficially for both. The management was free to continue to grow in the way they believed was best suited for the company while growing stock price meant that the investor remained happy. Nearly 8 years post his additional acquisition, VG Siddhartha now wants a way out and given the growth the investment has seen, it was doubtful that any fund would be happy to take their place either. Coffee Day – now a listed company – owns this stake and can use the money for expansion. 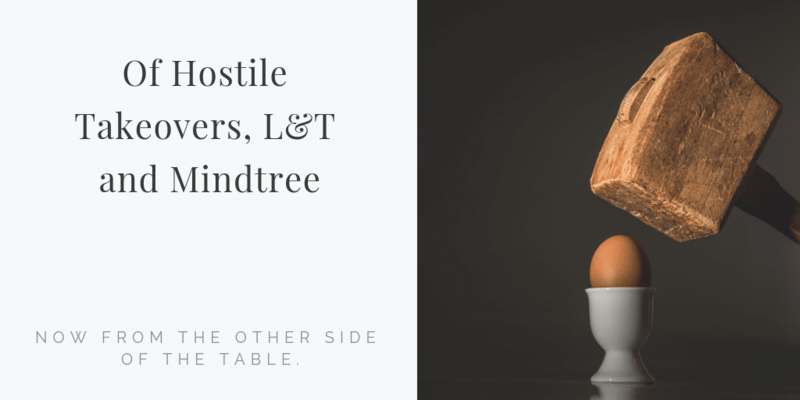 L&T has decided it will buy Siddhartha’s stake – so now, L&T will own 20% of Mindtree at Rs. 980 per share. And L&T already has L&T Infotech and L&T Technology Services. It’s probably a useful thing to merge all three, if it can get Mindtree also – the combined entity will probably have a market cap of 80,000 cr. In such a combination, the founders of Mindtree might have to give way to other leaders. L&T has also started the process of buying more shares of Mindtree and provided an open offer to other shareholders to sell to them. For 20 years, the founders of Mindtree have grown the company and one can understand the pain as it seems that just when things were going smoothly, they are close to being dispatched by someone who has more money. L&T has for now confirmed that it will allow Mindtree to run independently though an eventual merger cannot be ruled out for it makes no sense to run multiple companies in similar areas, especially after spending 10 thousand crores or more. Hostile acquisitions are one of the better aspects of capitalism in most mature markets for it keeps the promoters on their toes and ensures that the shareholder gets the best out of the company. The only way to eliminate such risk as Naik, the current chief of L&T pointed out long back was to grow and become so large that hostile acquisition becomes unduly expensive. Indian laws dissuade leverage buy-outs and this has meant that most mergers and acquisitions are of a friendly nature. Rather than protecting the promoters who control the destiny of not only their own but also of the fellow passengers, it would be best inclined if the government shifts its attention to ensuing that the promoters cannot ride rough shod over companies where they have a majority stake. 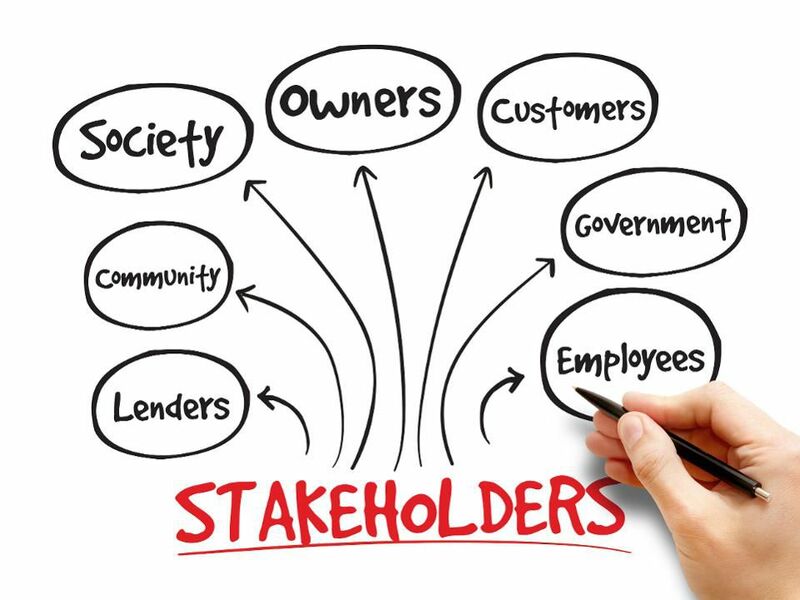 A company has to serve its stakeholders and as much as the promoters are the parents of any company, the stakeholders are more than just the promoters themselves. Creating value for every shareholder is what the board’s role is, not kneeing to the wishes and wants of promoters even if they are gem of a gentleman. Mindtree will be meeting today to consider the proposal to Buy back the equity shares of the Company. Mindtree has around 1000 cr. of cash and can buy back about 5% of shares. Since L&T has announced an open offer of shares, there is doubt whether they can do a buyback – because Section 26(2) of the SAST regulations at SEBI says you can’t do a buyback when an open offer is anounced. The board of directors are responsible not just for all the shareholders including L&T and from an angle to corporate governance would seem wrong to pursue the same at the current juncture. Most buybacks we have seen till date are by companies which wish to reward the shareholders by buying back a part of the equity shares at a higher price rather than pay dividend that is taxed on multiple levels. This is the first time a company has proposed a buy-back of shares in the midst of a takeover battle and would be interesting to note what SEBI has to say. Creeping Acquisition allows the promoters to buy up-to 5% of the equity shares in a financial year. If the promoters can somehow manage to find 1500 crores or thereof, they can acquire 5% before the end of the current financial year and another 5% at the beginning of the next financial year. While this will still not suffice to keep L&T out, with nearly 24% stake, they can at the very least be able to maintain ability to drive the decision making at the board level. Another way out for the promoters is to find a white knight who will be willing to buy a substantial stake in the company and hence foil L&T’s attempt to gather a minimum of 51% stake. L&T did the same thing – got Ambani on board when Chhabria wanted in. But with the single largest shareholder having already sold, its doubtful that even if such a white knight exists, he can accumulate enough shares in the short period of time available. At this point, a Mindtree isn’t a “buy” though if there is a battle for the management the open offer price can be materially higher than the current price at 957. In the early 90’s, the house of Tata found itself holding a very low stake in most of their major group companies. While the risk of take-over was low, why take a chance. Ratan Tata had a few years back been appointed as chairman of Tata Sons. To mobilize the funds required to hike the stake of Tata Sons in their group companies, Tata Son’s issued Rights shares which were subscribed by the group companies. The amount so realized was then used to buy stocks of the companies from the market. In addition, cash rich companies were encouraged to buy stock of group companies. In a few years, this ensured that the risk of a Tata company being lost in a hostile take-over was more or less negligible. While the L&T / Mindtree saga will disappear into the history books, the lessons for managements will not.